Argentina's financial state is interesting. As in other countries, the exchange rates for various currencies are posted in the media every day; there is an official rate for Argentinian pesos and the US dollar, and other currencies line up along that standard. But in Argentina there exists, in the open, an illegal rate as well, and that rate is posted in the media as well. When we arrived at the beginning of January the official rate was just under five pesos to the American dollar. Today, that rate is just over five pesos. The black market rate when we arrived was about six pesos to the dollar; today it is around 7.5 pesos, and climbing. Because of the restrictions the Federal Government puts on currency transactions, it is difficult for Argentinians to exchange their pesos for dollars. Therefore the rate they are actually willing to pay is greater than the official rate. Hence the illegal black market rate. Quite simply, Argentinians fear for their currency and have greater faith in that of the US. For some of us, that faith is probably misplaced, but given the inflationary pressures at work in this country, Argentinians, at least those who can do so, seek to protect their savings. Inflation is, according to the government, currently 11.1 per cent. Most independent economists believe a truer rate of inflation to be closer to 25 per cent and rising. Some economists are estimating an annual rate nearer 30 per cent. The government recently implemented, through talks with various business groups, a short term version of price and wage controls. How does any of this impact a traveller? Well, in our case it doesn't make much difference. Unless you are willing to travel with a large amount of American dollars and then exchange them illegally on a street corner, you are more likely to use credit cards, or withdraw money from an ATM. You will be charged a fee by the Argentinian bank, and probably by your own bank at home, but it is convenient and safe. And legal. It is important to note that Argentine banks will not exchange foreign currency for pesos to non-account holding foreigners. They are happy to do so electronically via their ATMs, and charge about four Canadian dollars for each withdrawal (I am guessing part of that is a federal tax of some kind). There is talk in the media about the official exchange rate increasing to six pesos by year-end, but by then the real rate, the illegal black market rate that most people will pay, could be closer to nine or ten pesos. There is also speculation that Axel Kicillof, Deputy Finance Minister and economic advisor to the President, would like to introduce multiple rates of exchange, depending on the transaction: for tourists, for travel abroad, for exporters, etc. That sounds complicated, but it might work. With mid-term elections set for October no one thinks any new measures will be in place before then. 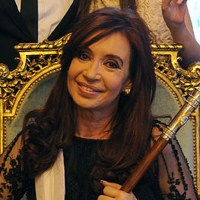 It is also rumoured that President Cristina Fernandez de Kirchner would like to alter the Constitution to allow her to run for a third term. In spite of her extremely high popularity in the last election, an amendment to the Constitution will be met with considerable protest, to put it mildly. Argentinos are anxious to see stability in their currency and growth in the economy and there is increasing and wide-spread dissatisfaction with the President's government. One of the drivers of inflation has been the rate by which the Federal Government has been printing money. Last year the money supply grew by more that 35 per cent, and there is likely to be further spending leading up the election. Public spending isn't a bad thing and it has helped employment rates and produced private spending spin-offs too. The unemployment rate, officially, is under seven per cent, and there are massive works projects, public and private, throughout the city. Argentina's economy is somewhat closed to foreign companies. There is strong preference for things of Argentine origin. You won't see many apples from Australia or oranges from Florida for example. Nor will you see the shelves of the supermarket filled with brand name over-the-counter medications. Here there are many small farmacias providing all the usual medicines and remedies, often in generic formulations, and offering advice, at low prices. You won't likely see many wines from other countries either; we like our own wines thank you very much. There seems to be an element of protectionism at work in this country. Direct foreign investment in Argentina is quite low. Last year in Canada and Australia, for example, foreign firms invested 47.2 and 48.5 billions of dollars respectively. In this country investment was only 11.0 billions. Neighbouring Chile saw a DFI of 26.4 billions of dollars last year. Not that foreign investment is necessary if you can raise the funds within your country, and small, resource rich countries like Canada and Australia, apparently cannot. But would Argentina's economy be better off with more investment from outside the country? Recently the giant mining transnational from Brasil,Vale, withdrew its proposal to invest almost 6 billions of US dollars in a project. The company claims problems with the exchange system, while the Federal Government says they would not concede to Vale's demands for tax concessions. So what to make of it all? There will be some interesting times ahead, that much is certain. Food on the table, at reasonable prices, is important. Keeping educated young people at home in Argentina is important too, as is welcoming new entrepreneurs into the economy, and protecting the savings of all citizens. As important as is the economy to the Argentine people, so too is the democracy they have created. The strength of that democracy, and the institutions entrusted to protect it, will be critical.